Now British Olympic medalist Tom Daley’s home, our Southwark penthouse offers a glimpse of a property purchased by a British sporting icon. This 3-level unit features signature Brandler London kitchen and wardrobes, in our warm, textured reclaimed wood. 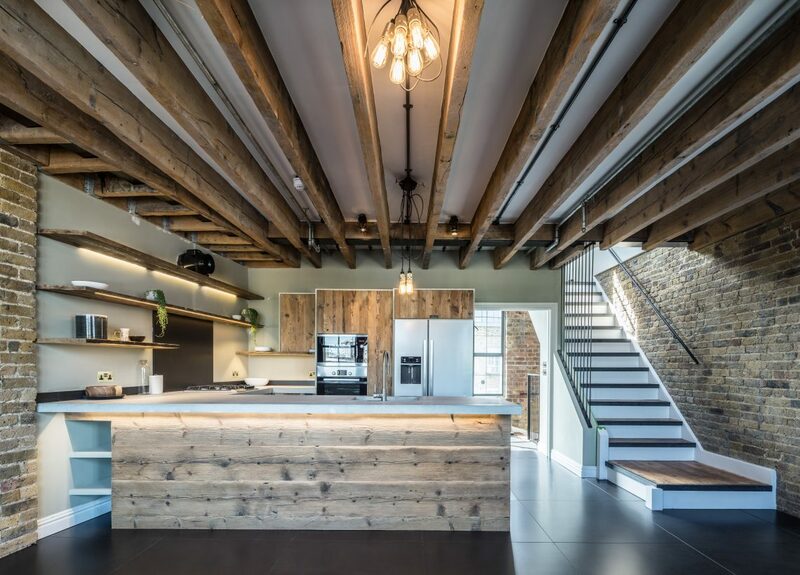 Part of a Brandler London warehouse conversion, the historic structure was originally built for hops processing. It was filled with textured masonry and old timber. As a result, almost all of the reclaimed wood we used in the refurbishment was from the original warehouse. We then developed a material palette of concrete, metal, and reclaimed wood to create a stunning composition of orthogonal lines throughout the home. We removed the warehouse’s old timber joists in construction and gave them new life to finish the open kitchen. Firstly, we used the reclaimed wood on the backlit floating shelves. These serve as a prime location to display the owner’s kitchen favourites. Secondly, we cut and planed the warehouse joists to create the doors and drawer fronts for the concealed kitchen storage. To complete the look, we clad the back of the kitchen peninsula in reclaimed wood as well. We used concrete worktops with downlighting LED’s to contrast the warm, rich wood with sleek yet durable modern surfaces. We located the kitchen and dining areas on the centre level, creating a hub of cooking, dining, and entertaining. In addition to the kitchen, we used reclaimed wood from the warehouse in the master bedroom’s wardrobes. We fitted the drawer and door fronts with a light toned wood that features embedded rusted nails. Part of a foot-long measurement system, these numerated markings reveal the inner workings of this warehouse’s former life in the hops processing era. New bespoke mild steel stairs lead up to the new roof deck. Carefully designed with entertaining in mind, this space features a new jacuzzi and 270-degree views of the London skyline. Each of these meticulously designed interventions sought to blend a modern aesthetic with historic and industrial materials. The result is a contemporary home in a historic building that feels modern and industrial while maintaining the warmth and textures of a well-loved home. The project was a collaboration between Brandler London, Polly Playford who consulted for interior design, and Pravin Muthiah from Coupdeville as our lead architect. The owner was also featured in his new kitchen in this recent post on the Guardian. Find more images of Tom Daley’s home in our project gallery: Southwark Penthouse and Tom Daley’s Wardrobes.